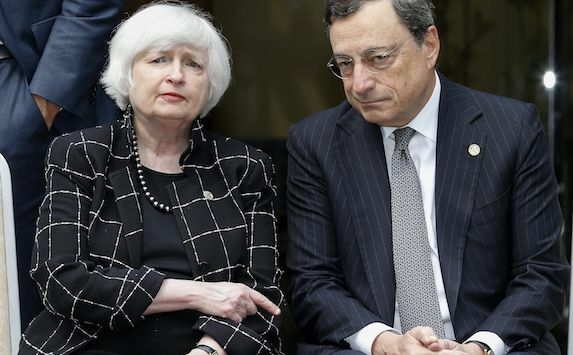 Yellen and Drgahi headed to Jackson Hole. Federal Reserve Chair Janet Yellen and her sidekick junior money printing partner, European Central Bank President Mario Draghi, will be among the officials addressing this year’s installment of the annual money printing conference in Jackson Hole, Wyoming that is hosted by the Kansas City Fed. The 2017 Economic Symposium will take place this week from August 24th to the 26th. the mountain resort area is a valley between the Teton Mountain Range and the Gros Ventre Range and that the term "hole" was used by mountain men, who primarily entered the valley from the north and east and had to descend along relatively steep slopes, giving the sensation of entering a hole. Indeed, the central bankers meeting this year are in something of a hole, attempting to figure out how to shrink the massive balance sheets they have created by flooding the system with money since the 2008 financial crisis. Yellen will do her best to pretend she is at a Caribbean beach resort and that it will be as easy as her slipping into a bikini. She will speak with a straight face about financial stability, at 8 a.m. local time (10 a.m. in New York) on Friday, the 25th. Draghi will take the podium with a straight face at 1 p.m. on the same day speaking on the theme of this year's symposium, "Fostering a Dynamic Global Economy." The money printers will display their ability to say nothing of significance in a pseudo-scientific manner, while they continue their money printing ways. And it will all be taken as sound commentary by mainstream news networks. Until price inflation climbs above 3% as measured by government indexes, Yellen will pretend she has everything under control--which is a myth. The Fed has sound control of nothing. I believe that the justification for the Fed, to bring price and economic stability, has never been a success. I repeat, prices since the start of the Fed have climbed by 2,241% and there have been over the same period 18 recessions. Price inflation will continue to climb and there will be more recessions in our future. Maybe Yellen will escape in time (I give it 50/50). Her term as Fed chair expires on January 31, 2018, and perhaps Gary Cohn will get to be battered about in the next crisis but rest assured there is a crisis in our future, regardless of what gobbledygook about financial and economic stability Yellen spouts at the mountain resort.